Heavy floods hit vast regions of Golestan province, northern Iran. Locals providing help for each other when Iranian officials refuse to do so. As people across Iran are celebrating the Persian New Year, Nowruz, heavy rains and flooding have been pounding Golestan province in northern Iran since Sunday, uprooting trees and causing serious damage to the province’s facilities and power lines. Heavy rainfall caused overflow of the Tajan River, in northern province of Mazandaran, forcing people to evacuate the area in central parts of city of Sari. Reports from state-run media indicate that roads leading to 70 villages in Golestan and more than 200 in Mazandaran have been flooded. 20 villages in Golestan have been evacuated. 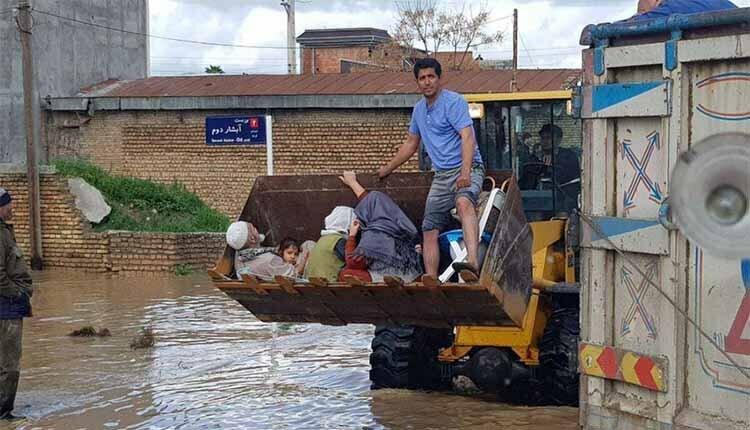 According to the Mazandaran Crisis Management Department, the floods affected about 200 villages in the province, causing damage to 1,500 homes in urban areas and 30 to 50% of homes in rural areas. In addition, dozens of communication bridges were destroyed or damaged in neighborhoods and villages. The head of Iran’s Crisis Management Organization reported that 40 villages in Golestan province still have no electricity. According to Mojtaba Jamali, the Director General of the Golestan Province Crisis Management, the town of Agh Ghola in Golestan was facing the most severe problems. Two people died after a landslide in Golestan in the past few days, Jamali announced. Previously the minister of energy had reported that 360 villages in Golestan province and 193 villages in Mazandaran province had lost electricity. Golestan Crisis Management Department announced on Thursday that “currently over 10 villages in this province are under water. Videos of the recent floods show how the locals are providing help for each other when regime officials are refusing to do so. According to the state-run Khabar Online Website, Iran floods have significantly increased in the past year with 552 cases taking place in the course of just 4 years. Deforestation is carried out in full by the government with “33% of forests in Iran having been destroyed”, according to state-run media. That means that the 18 million hectares of Iran’s forests have shrunk to just 12.4 million. Last October Iran floods which hit the three provinces of Northern Khorasan, Mazandaran and Gilan provinces killed eight people. The 2017 Northwest Iran floods which affected the provinces of East Azerbaijan, West Azerbaijan, and Kurdistan on April 14, 2017, claimed the lives of more than 40 people.